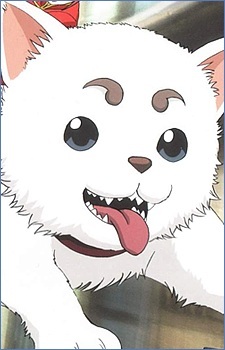 Sadaharu has the outward appearance of a giant dog, but is actually an inugami. When sitting on his haunches, he is taller than most humans. He was left in front of Gintoki's apartment in a box that had "To Mr. Freelancer" written on it. Sadaharu chomps on anything smaller than itself, such as Gintoki's and other people's heads. Kagura seems to be the only one who can control him, for she has immense strength, though he chomps on her occasionally. Though he was dangerous when Gintoki first received him, he has become quite tame in the later episodes, and has helped the main characters in many occasions. He was named by Kagura, after her first pet, a rabbit which she accidentally killed while having a nightmare. He was originally owned by a pair of miko sisters, who initially called him Kamiko. Recently, Sadaharu has impressed a yakuza's boss and receives permission to date his dog (whom Sadaharu himself has fallen in love for).